The SOFIA aircraft is a Boeing 747SP with a distinguished history. It was originally acquired by Pan American World Airways and was delivered in May 1977. The "SP" designates that this is a special performance, short-body version of the 747, designed for longer flights than the Boeing 747 Classics (747-100, -200, and -300 series jetliners). Although Pan Am typically named its aircraft after famous clipper ships, they gave this aircraft a special name -- the Clipper Lindbergh -- in honor of the famous aviator Charles Lindbergh. Lindbergh's widow, Anne Morrow Lindbergh, personally christened the aircraft and officially placed it into service on May 6, 1977 -- the 50th anniversary of his history-making first solo flight from New York to Paris in 1927. In February 1986, United Airlines purchased the plane. United removed it from active service in December 1995, and it was purchased by NASA in 1997. The aircraft was substantially modified for its new role as a flying astronomical observatory by L-3 Integrated Systems of Waco, Texas. To ensure proper modification, a dismantled section from another 747SP was used as a full-size mock-up. On April 26, 2007, SOFIA made its first post-modification flight in the skies over Waco, Texas. It was subsequently flown to Dryden Flight Research Center at Edwards Air Force Base, Calif., for continued flight testing, and was rededicated on May 21, 2007, by Erik Lindbergh (Charles Lindbergh's grandson). On January 14, 2007, at the end of its closed-door flight testing, SOFIA briefly visited Ames Research Center before continuing on to its permanent flight operations home at the new AFRC-operated Dryden Aircraft Operations Facility (DAOF) in Palmdale, California. "First Light" flight achieved in May 2010. The first astronomical targets imaged by SOFIA were the planet Jupiter and the Messier 82 galaxy. The FORCAST instrument was used for these observations. 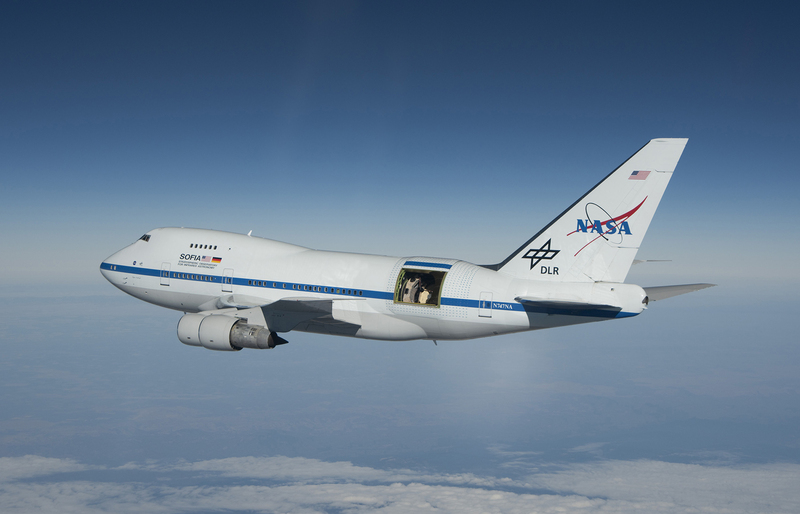 SOFIA made its first flight with the German REceiver for Astronomy at Terahertz Frequencies, or GREAT, in April 2011. In September 2011, SOFIA made its first transatlantic deployment to Germany. SOFIA deployed to Christchurch, New Zealand, for observations of the southern sky in July 2013. SOFIA studied the comet ISON in November 2013. The Boeing 747SP that is SOFIA underwent extensive modifications by L-3 Integrated Systems in Waco, Texas, from 1998 to 2007. L-3 Integrated Systems was responsible for the aircraft's modifications including design engineering, airframe structual modifications, telescope design integration, and flight test activities. retrofitting the interior to provide working areas for scientist and educators. Installing a 2.7-meter telescope in an airplane had never been done before and the modifications necessary posed many complex and challenging problems for the engineers. One of the most challenging problems is keeping the aircraft steady while flying with a 20-ton telescope in a huge cavity in the rear of the plane that is opened to the sky. To help ensure a successful modification, design and engineering solutions were tested on a mock-up prior to work on the actual aircraft. Now you can print your own 3D model of SOFIA, the Stratospheric Observatory for Infrared Astronomy. 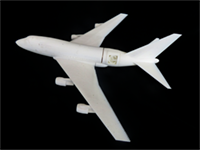 With the help of the staff of the NASA Ames SpaceShop Rapid Prototyping Facility, the SOFIA mission team created an eight-piece, 3D-printable model of the modified 747SP aircraft, its telescope and cabin. The printable files are at a 1/200 scale, with a removable upper fuselage section to reveal interior details, including the flying mission control center in the cabin, interchangeable science instruments and both open- and closed-telescope door configurations. The model has been simplified for durability and printing where needed.